A Diamond Select Toys Release! Boba Fett? Where? On your brand-new bottle opener, that's where! 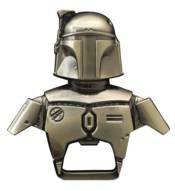 Make sure you always have a way to open tasty beverages with this solid metal bottle opener, depicting the portrait of Boba Fett, super-cool bounty hunter extraordinaire! It measures 4 inches long, has magnets on the back and removes bottle caps like Boba Fett captures a bounty -- with style! Comes packaged in a collector's slip case with a full-color wrap.